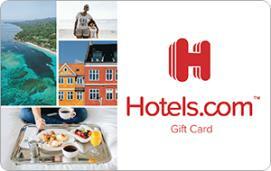 Earn 5.1 SB per $ when you buy Hotels.com gift cards at MyGiftCardsPlus, powered by Swagbucks. The perfect gift for any occasion. Choose from over 135,000 hotels worldwide, including major hotel chains.